Now that you’ve all enjoyed Mother’s Day, time to kick it into high gear with us. Our Diet Best starts THIS Wednesday! Click here for more info, and to join up! One of you is getting $250 bonus cash and everyone gets a free workout plan! The odds are great right now, so come join us! Now, chicken. I always like the idea of roasting whole chickens, but honestly I never have great luck with them in the oven. I’ve tried a million different ways and I’m just never overly impressed (or at least not as impressed as I am with the chicken-of-all-chickens, the Costco rotisserie.) The best, I’ve tried, is made using my Thermador Steam oven, but that’s not standard kitchen equipment. 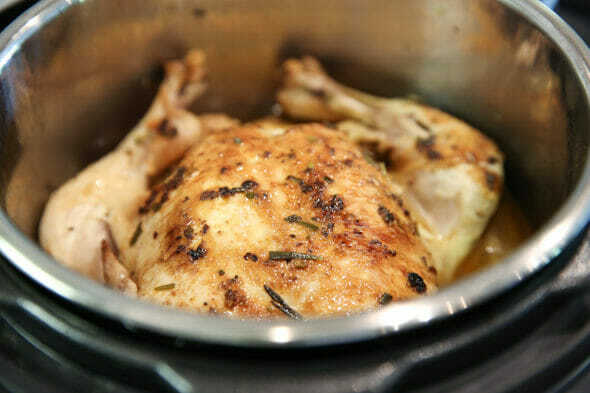 After having such great luck with chicken breasts in my Instant Pot Electric Pressure Cooker (read all about it here, if you want more info) I thought I’d try whole chickens. The result was a tender, juicy bird that took just minutes to prep, and not long to cook. Whole chickens are often really inexpensive to buy, so this is a great way to quickly cook them up and either serve them as is, or chop up all the meat for meal prep throughout the week. And I was surprised that unlike in a slowcooker, you can actually get a nice browned skin in the pressure cooker! 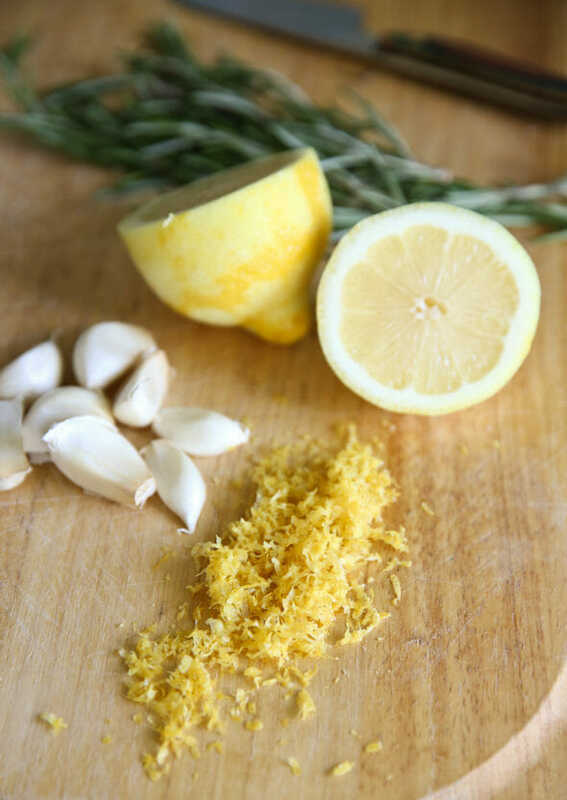 You can really use any flavor combination here, but I’m going with a favorite because I seem to always have lemons and garlic and rosemary around. I make a quick spice rub with fresh garlic, rosemary, and lemon zest, plus some salt, pepper, and oregano. Olive Oil brings it all together, and I like our Rosemary oil here, though I often use lemon or garlic as well. You’ll simply rub this mixture all over your chicken. 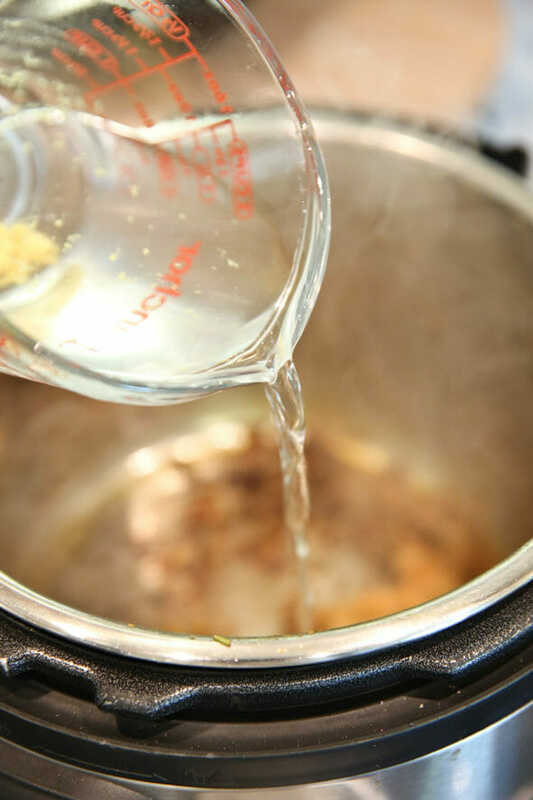 The first thing you’ll do is heat up your pot to saute mode (or just pop it on the stovetop if you have a traditional pressure cooker) . I have this electric Instant Pot. When the pot is hot, drizzle in a little more oil and then place the bird in there, breast-side down. We’re first searing the bird to get that nice golden crust and also to develop flavor in the pan. After a few minutes, you’ll flip the bird to sear the other side and then remove it from the pan. The pan should have all of these browned bits stuck to the pan and that’s what we want! Pour in a cup of chicken stock (you’ll notice I just tossed in some granulated broth in my cup of water) and then use a spatula to scrape off all of those bits as the water simmers. Cut up a whole onion into 4 quarters and place them on the bottom of the pan and the place the chicken on top. The onion kind of forms a rack for the chicken, as well as adds flavor to the juices we’ll use later. Then just turn your pressure to high and cook for 6 minutes per pound of chicken. I have to clarify that ALL pressure cookers are different. I’ve found that 6 minutes per pound tends to turn out perfectly for me, but if you try it and it’s not quite enough, or too much, just adjust and try again and you’ll find your perfect number. For me, this results in a perfectly cooked bird that’s nice and juicy all over. I like to slice off the breasts and carve them nicely and then pick apart the rest of the bird and just kind of chop it up. You can serve this as-is, or use the whole thing in recipes like salads, burritos, sandwiches, etc. Once you remove the bird from the pot you’ll have a whole pan full of flavorful juices. 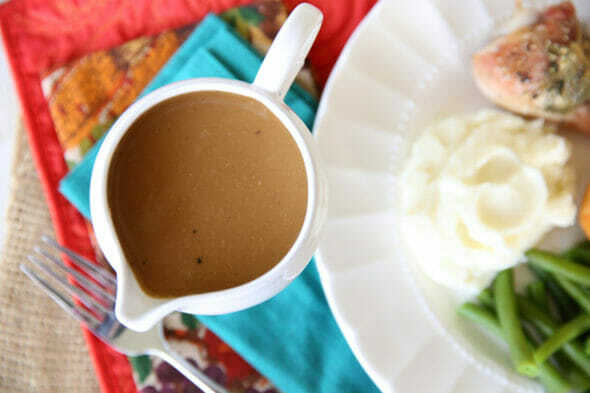 Follow this tutorial to make homemade gravy to serve with it. 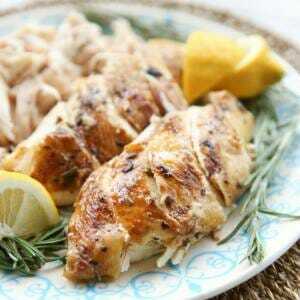 You’ll have the flavors of lemon and rosemary already in there so it’s a perfect compliment! 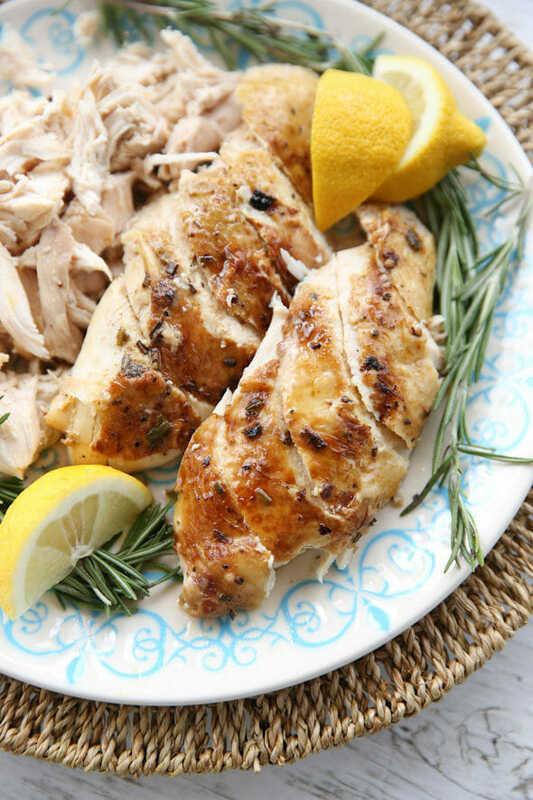 An easy cooking method for a whole chicken, which produces tender juice meat and cooks up in about 30 minutes or less! Use drippings to make an easy gravy to serve over the top. Remove anything inside of bird. Gently rinse entire bird with cold water and pat dry with paper towels. Place in baking pan or platter and set aside. Preheat electric pressure cooker to saute mode, or start warming stove-top pressure cooker on stove top. 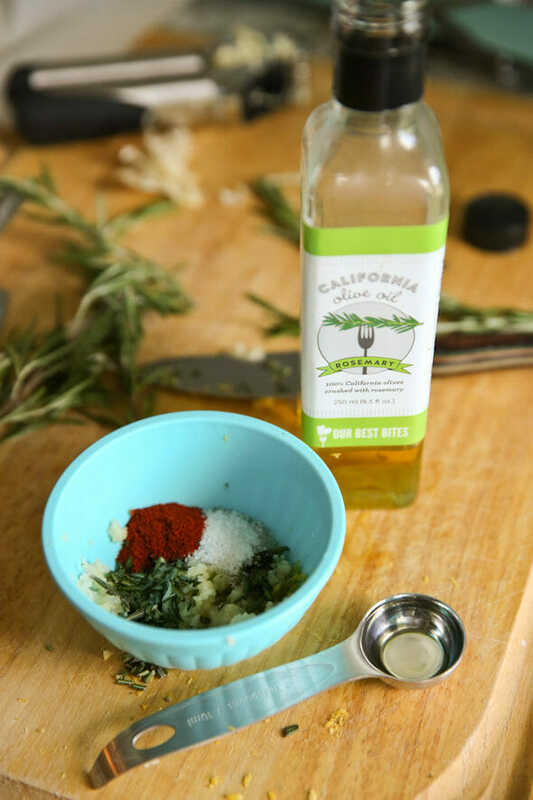 In a small bowl combine rosemary, olive oil, garlic, paprika, salt, pepper, and lemon zest. After zesting, cut lemon in half and stuff in cavity of chicken. Spread spice mixture all over bird, massaging onto all sides. 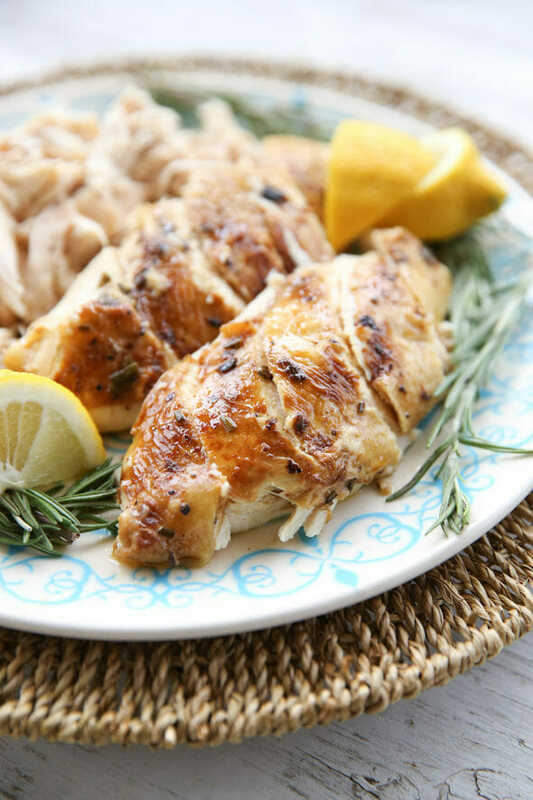 Drizzle some olive oil in your hot pan and place chicken breast-side down into pot. Leave for 3-4 minutes, until golden brown. Flip chicken over and repeat for other side. Remove chicken from pan and set back onto platter or baking dish where it was before. 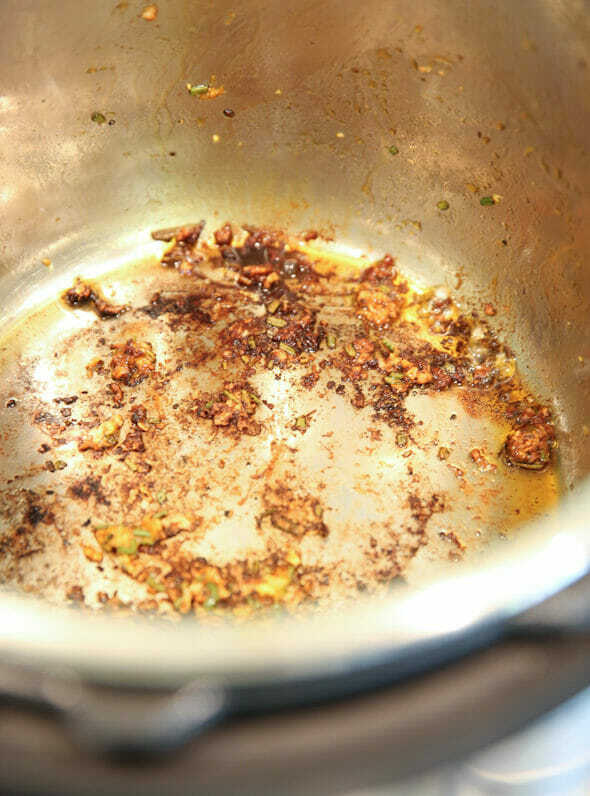 Add broth to pan and use a spatula to scrape off browned bits from pan. Cut onion into 4 wedges and place on bottom of pan, place chicken on top (breast-side up) and secure lid. Cook on high pressure for 6 minutes per pound. When time is up, let rest for 10 minutes before releasing steam. 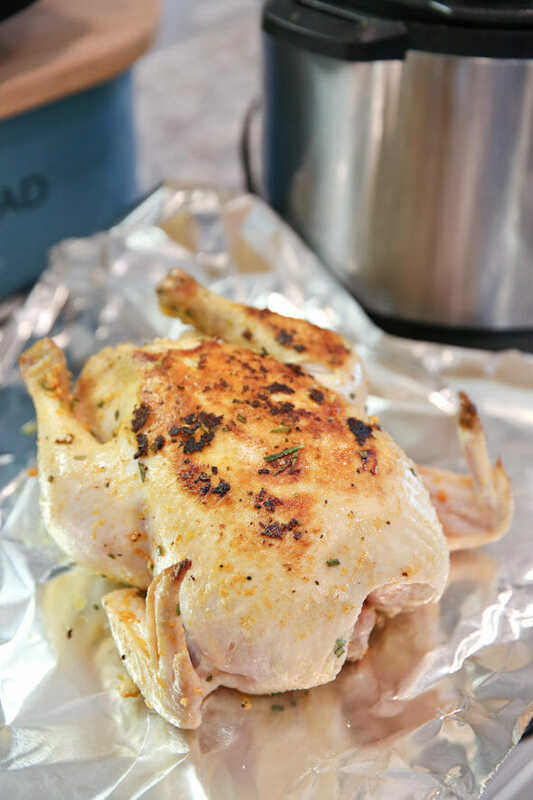 Remove chicken and place on cutting board tented with foil for at least 5 minutes before slicing. If desired, separate juices in pan and make gravy. All pressure cookers are different, use this as a guide and adjust for your own pressure cooker if necessary. This is so great! I used to roast whole chickens in my oven, but I got tired of how much they splatter and make the oven dirty so I quit doing it. I will definitely try it in my pressure cooker! Thank you! Made this for dinner tonight. Super yummy and moist! You suggested that we might have to adjust the cooking time for different pressure cookers. Yep. I have a traditional stove-top pressure cooker and cooked a 6 pound chicken. It was a little too pink in the center. Next time I’ll cook for 7 minutes per pound. Thanks for another “keeper” recipe! Cannot wait to try this. My kids love rotisserie chicken. So, you just place the chicken on top of the onions and it cooks in the broth? You don’t use the trivet that comes with the Instant Pot? I would think cooking the chicken in the broth woud result in a mushy mess, but the chicken in your pictures looks great! Thanks for this recipe! You can definitely use the trivet, I literally have no clue where mine is so I’ve never used it, haha. I like the flavor the onion adds so I just use that, but feel free to use the trivet! I just got my pressure cooker for Mother’s day! So keep the recipes coming! I am kind of nervous to use it. It sounds like it can get messed up pretty easily. Also, I have started doing my own whole roasted chickens so this recipe is perfect. I feel like every time I have something I want to try or have recently tried, you guys post a similar recipe. After making your recipes for years and years I still love what you post! Oh I’m so happy to hear that! The pressure cooker takes a little experimentation, but after you play around with it a few times you’ll be an expert in no time! I made this for dinner last night and it was wonderful! The chicken didn’t have the crusty skin that you get from an oven cooked bird, but then none of my family likes chicken skin, so no points off there. I cooked for the recommended 6 minutes per pound, and rounded up for the additional 1/2 pound. There was a lot of juice for gravy too with this method, and more gravy is always appreciated. 🙂 I never seem to get the timing right when I roast a chicken in the oven; its always either too dry or still pink. I found that your recipe worked like a charm. Thanks!! Please keep the pressure cooker recipes coming! Can you put a sprig of rosemary or half sprig into the cavity with the lemon halves? Or will that be overpowering? You don’t baste or use the lemon juice anywhere? Just use the zest? Thanks. This recipe looks great. I made this for dinner last night… My kids especially my son Rouel said that it was so much tastier than my previous chicken recipe. But next time i will definitely add more rosemary and a thad more of paprika. Don’t have a pressure cooker. Roasted in oven covered with foil for the first 30 minutes..then removed foil..conti yes cooking the remaining 30 minutes..
Could you try this with chicken breasts? Can’t wait to try this! I recently got an Instant Pot and this sounds like a great way to cook a chicken. I’ve heard that the Instant Pot can cook frozen meat just fine, but do you think it would work with a frozen whole chicken? Or should it be fresh? I would thaw the chicken first. You CAN pressure cook frozen meat- I do it sometimes with frozen chicken, but I probably wouldn’t do it with a whole chicken just because it’s hard to make sure everything cooks evenly. Just wondering about medium rare steak??? Just had my new instant pot appliance, and first time I used it, a little scary for me, but made bone broth, aND beef pot roast, I cannot wait to make that lemon chicken and I finally got an answer on how to roast chicken using pressure cooking, and the use of trivet, but , I’m wondering if cooking a steak will give you the same taste as pot roast????? This was so good and so easy! Used a little lemon justice since I didn’t have the fresh lemon to zest and was still very good. Hey Melissa! You’re not a downer at all- I know it’s frustrating when things don’t turn out like you expect! If you had that problem, maybe you just had an extra juicy bird?? Do you have a smaller pressure cooker? I would try a smaller bird and make sure it is completely thawed (not frozen) before cooking. I’ve made these lots of times and I’ve never had it fill all the way up with juice so I wouldn’t loose hope quite yet! I made this chicken tonight and it was delicious. Thank you for an great, easy recipe. Sara, I would love to try this in my IP. I’m wondering if you peel the onion? And do you discard it at the end?Thanks! I’m trying this tonight. My Instant pot is an 8 qt. What size did you use here Sara? 8 qt is just fine! Am going to try this Sunday after church.